Lemme tell you straight; if you’re not using keywords through your Pinterest, you’ll never get decent traffic from Pinterest to your blog. Why? Because Pinterest isn’t just a social media platform. It’s also a search engine. Just like optimising your posts to rank high on google (you can check out how I rank first on Google here). You can optimise your pins (and boards and profile) to come up first when people search for a specific term. Meaning more traffic to your blog! 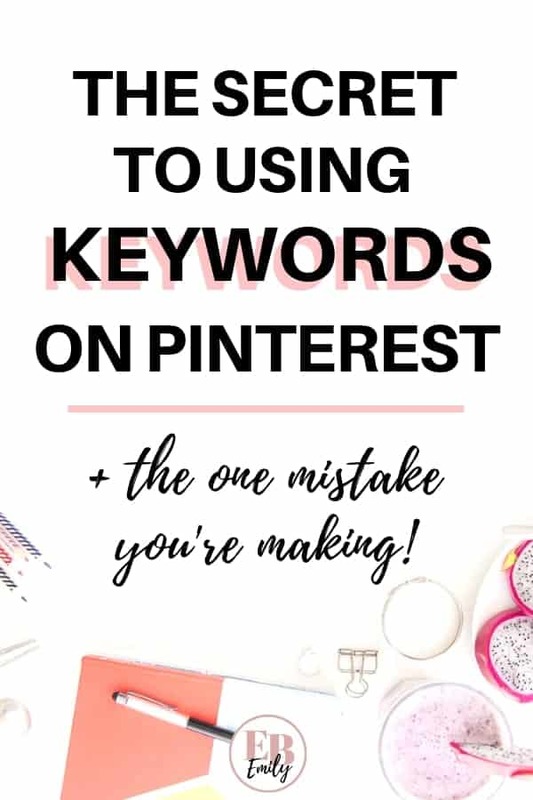 The best way to do this is using keywords throughout your Pinterest. Now you’re probably thinking “how do I find these keywords? And where exactly do I put them?!”. That’s why you’re here! This post is all about how to find Pinterest keywords and exactly where to use them. Skip to the end to download your free check list to make sure you’re using keywords in all the right places! Firstly, where can we find keywords to use? One of the best ways to find lots of Pinterest keywords is to search for them on Pinterest. For example, I have written a post about the best feminine WordPress themes. I had an image from that post I wanted to save as a pin, with a well optimised description. So I searched for WordPress in the Pinterest search bar. You can see Pinterest suggests phrases people search when they start their search with just “WordPress”. In this situation I could use lots of the keywords suggested like “WordPress design” and “WordPress website design”, because these are both relevant. It’s also good to use both general topics (in this case WordPress) and specific topics (So WordPress theme) as keywords, to engage a wider audience. (The other search suggestions are also clues about what other potential topics pinners are also interested in when searching for a different. In this example, people who search for the term WordPress are also interested in WordPress tips. So it’ll be helpful for me to link to a post on WordPress tips in my WordPress themes post, as people are clearly interested in the two!). If you then click on the word you were originally searching for, pins will come up with that keyword in the description. However above these pins we can see a list of words. These “titles” are words that people who searched for WordPress have also searched for, with the most common one first. So I can see a lot of people who search for WordPress are also interested in WordPress For Beginners. Therefore I can use these keywords in order to gain the attention of more of my potential audience. I recommend thinking not only about Pinterest keywords, but different ways people will phrase that keyword. For example if you write about curly hair, the keywords ‘curly hair’ and ‘curlies’ mean pretty much the same thing, but some people are more likely to search using one keyword than the other. SO use them both! Put them both in your board description, and your board is more likely to come up when they search for either keyword, and better engage the potential follower as they’re not reading the same phrasing constantly. If I go to search for ‘WordPress For Beginners’, Pinterest actually suggests even more ways of phrasing this keyword I can use. Both “WordPress for beginners” and “WordPress for beginners tutorials” would be engaging the same target reader (a newbie to WordPress). You could therefore use them both in the same description to reach more people with the same interest. So you know where to find your keywords on Pinterest. Now it’s time to actually use them! Firstly, even your Pinterest name can have keywords, so when people search for those keywords your name and profile comes up. See how my profile has what I specialise in within my name? That means people searching for those words might see my profile as a result. They will know straight away what I have to offer! Again, here you can use keywords so people are more likely to find your profile. Also so that when they do find your profile, they understand what you are interested in or what your blog is about immediately. You’ll want to use a lot of Pinterest keywords in your board description. This will help you rank for a number of different keywords. However, SEO is not only about ranking for Pinterest, but getting the best user engagement as possible. If your profile is just loads of keywords separated by commas, it might suggest to followers that your are spam. Then they might not follow you! Make sure you use keywords to help you get found, but use them well to clearly explain to potential followers what you have to offer. This will mean more people will follow your board when they click on it, and signals to Pinterest this board is getting followers, bumping it up in search results for the corresponding keywords. Here I’ve only used around 5 keywords, but since then I’ve gone back through all my boards and added more text. Board descriptions have enough space for 500 characters, so you may as well use them! This one is perhaps the most important one. Most of the time people don’t change the pin description before they pin it. SO, you’re going to want to make sure you have already done the hard work for them. Write an amazing pin description full of keywords before they share it. But remember the user engagement: no keyword stuffing. In this pin, I’ve asked the viewer if they need something, so if they do, they know my pin will help. I’ve also used the term “check out” to encourage engagement and click throughs to my blog. Then I’ve used relevant keywords to the blog post topic, but worded differently here and there to engage more people e.g pick a name for your blog, amazing blog name, blog name you love, etc. Now you know what keywords you should be using and where on Pinterest! If you need more Pinterest help, be sure to sign up for my free Pinterest course, where I teach you how to use Pinterest as a blogger. Make sure to get your free checklist by signing up below! (You also get access to the free resources library). Great tips Emily, thanks for sharing.